FORMER DIRECTOR OF the FBI James Comey has described the separation of children from their parents at the Mexican border in recent months as shameful and disgraceful. 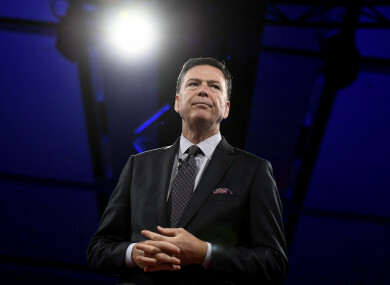 Comey, who was appointed by President Barack Obama and fired by Donald Trump, told RTÉ’s Today with Sean O’Rourke what has been happening on the border is “utterly inconsistent with who we are as Americans”. He said if there is any good to come of putting children in cages, it would be that the American people “wake up” to what he has been talking about – the threat to American values. He said it is a “shameful, disgraceful episode in the history of my country”. People need to wake up to the fact that this president and his approach jeopardises that which makes us Americans. He said he found it “shocking” that the President had asked him for personal loyalty as it had been important since Watergate to keep distance between the government and the FBI. Comey was also asked about the impact the FBI investigation into Hillary Clinton’s emails had on the presidential campaign. In her book, Clinton wrote that she felt he had “shivved” her. He said if he were to speak with Clinton, he would ask her to read the chapter in his book about how those decisions were made. Email “Former FBI director: Family separation is a 'shameful, disgraceful episode' in US history”. Feedback on “Former FBI director: Family separation is a 'shameful, disgraceful episode' in US history”.